Pickled Carrots – Improved! This is a personal family recipe from our mid-west family. 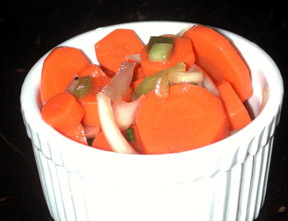 Coin-diced carrots, with onion and pepper, then pickled in a savory-secret blend. Thank you Grandma! These gems keep for a long time, so you can store and enjoy for more than a week. Less than 100 calories/serving. 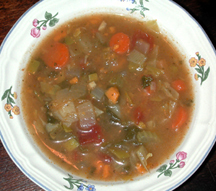 Simply Veggie Soup! I suggest ordering by the quart, because it’s that yummy and a great solution for breakfast, a snack, or lunch/dinner. 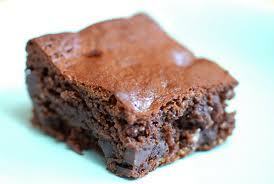 Only about 90 calories per serving! Yet, it’s filled with flavors from onions, carrots, celery, roasted sweet potato & butternut squash, rutabaga, leeks, greens, tomatoes, etc. PROTEIN WRAPS! This week, try our tasty and healthy Buffalo “Wing” Wrap – NEW! This is exciting! All the flavors with calorie-control! Roasted chicken with a bit of hotness. Then wrapped with celery, a bit of blue cheese, onion, bell pepper and couscous. Wrapped in romaine and/or tortilla. We will include a hot dipping sauce if you need a bit more heat! About 320-calories per serving and about 55 grams of chicken! Can request no tortilla if received by Saturday! Garden Green Salad! Our BIG green salads are fresh, seasonal, and diversified with a variety of veggies, protein, fiber and flavor! This week’s salad includes: sunflower seeds, carrots, apple, beans, bell pepper, parsley, red onion, snap peas, and celery, with a home-made balsamic dressing. (less than 220 calories/container). You can ADD 64 grams of fresh roasted chicken to your salad for only $1.50 (please order by Saturday). Natural Protein Bars! Handy, tasty, healthy, and chemical/ preservative-free (so much better than the commercial ones that stay on the grocery shelf for a year!). Each bar contains 15 grams of protein and only 180 calories. This is a great snack/breakfast solution for busy day. This week flavors, as available: Choco-Peanut or Lemon! 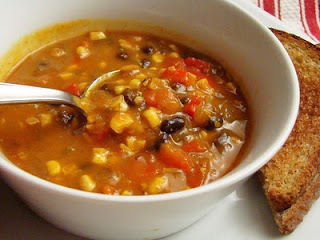 New Featured Soup Family Member! 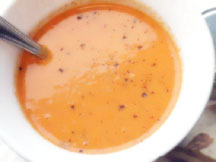 Spicy Sweet Potato Soup! 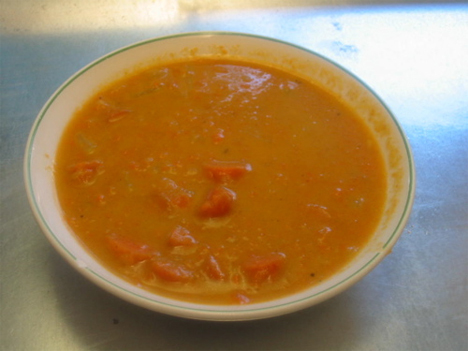 This brothey soup is quite exotic with sliced sweet potatoes, tomatoes, coriander, cumin seed, turmeric, and fresh ginger. A surprise to the taste buds and very purifiying for your blood system. 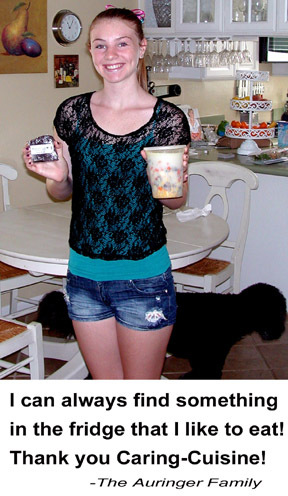 (Only 100 calories/serving). Quinoa with Nuts and Pomegranate NEW!! Perfect blend of taste with super nutrition! Quinoa is the only plant protein source that contains all essential amino acids! Perfect for the vegan and their friends! Quinoa is not a grain; it’s a seed from the chard family. This side includes fresh scallions, parsley and mint, and sweet pistachios, almonds, pomegranate, and dried currants, in a zesty dressing. About 180 cals per serving. 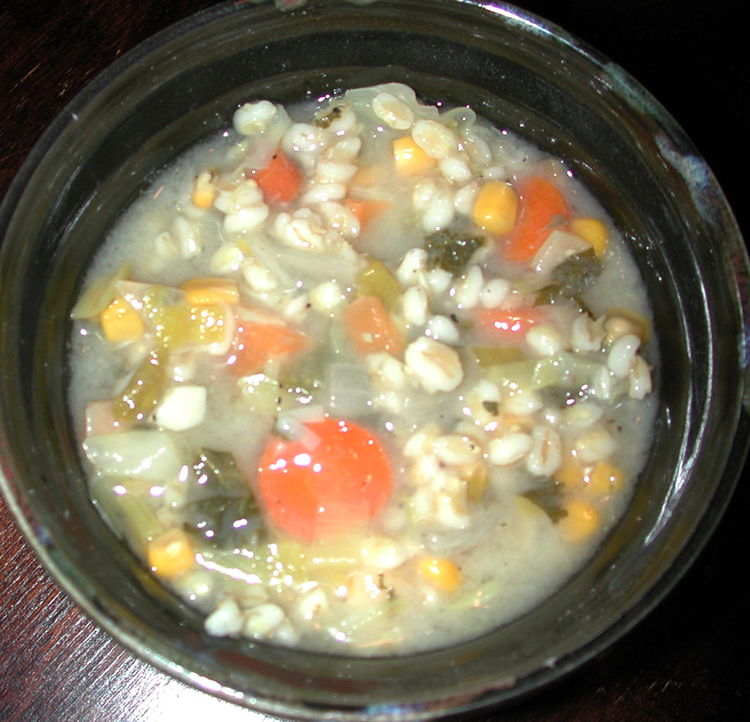 Barley n Greens Soup! This is my favorite soup. 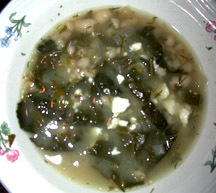 I literally lick the bowl with this herby, lemony, textury, nutritious, low-calorie soup. Trust me, you’ll like it! Oh, you want to know what’s in it, rather than just follow my suggestion? Ok, it has spinach, kale, chard, and barley, flavored with green onion, dill, mint, fennel fronds and lemon, in a vegetable broth. We include a Feta cheese topper. Can be customized with NO FETA TOPPER if requested by Saturday. Only 140 calories/serving. Fall Harvest Side! We are bringing back this full flavored side dish for your seasonal enjoyment! 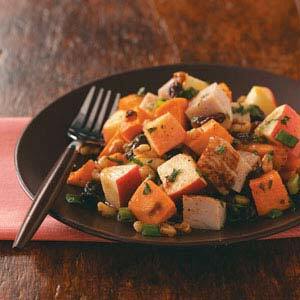 We bring together the flavors of fall with roasted sweet potatoes, walnuts, celery, apples, raisins, and parsley with a flavorful citrus/ginger dressing. Packed with fiber and nutrients, about 190 cals/serving. Tzatziki Dip! Big and bold flavors in this Greek yogurt-based dip! You will be amazed on its freshness and yummi-ness Cucumber, lemon, dill, mint in a yogurt-based dip! YUMMY! We have the cucumber discs to dip with! PROTEIN WRAPS! 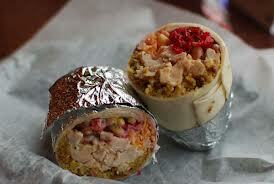 This week, try our Chicken Curry Wrap! All the flavor and mindful of the calories, with home-cooked roasted chicken strips, couscous with mint and lemon, bell pepper, cucumber, red onions, and apple, with a sweet curry dipping sauce. All wrapped in crunchy romaine and a flour tortilla. About 320-calories per serving and about 20 grams of protein! Can request no chicken or tortilla if received by Saturday! 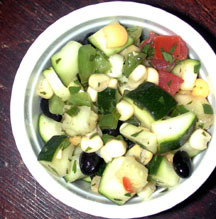 Greek Green Salad! Our BIG green salads are fresh, seasonal, and diversified with a variety of veggies, protein, fiber and flavor! This week’s salad includes: tomato, cucumber, Feta cheese, red onion, bell pepper, and Tapenade (chopped olive), with a homemade oregano vinaigrette. (less than 250 calories/container). And may include a sliver of avocado if I have enough. 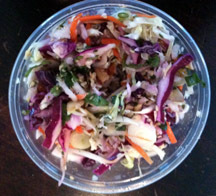 You can ADD 20 grams of fresh roasted chicken to your salad for only $1.50 (please order by Saturday). 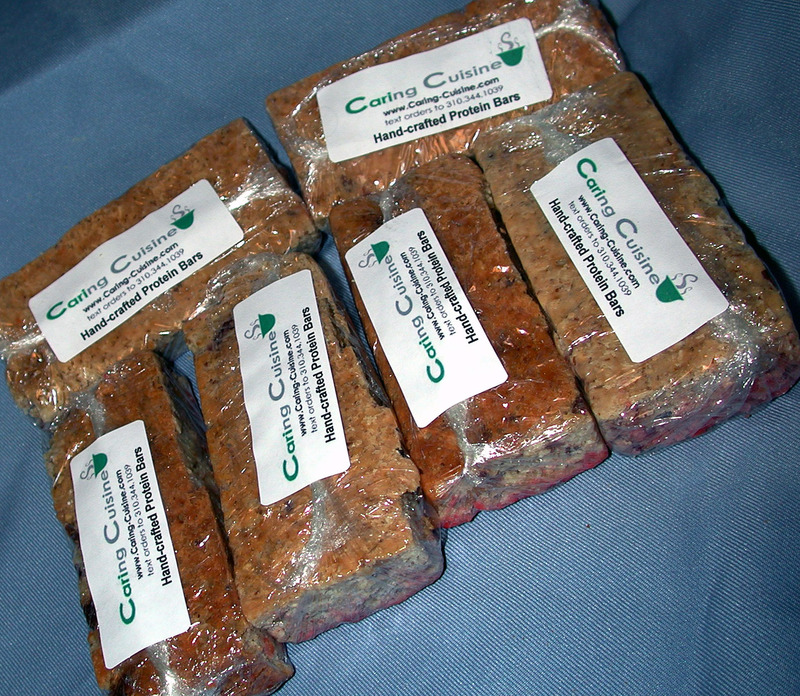 Natural Protein Bars! Handy, tasty, healthy, and chemical/ preservative-free (so much better than the commercial ones that stay on the grocery shelf for a year!). Each bar contains 15 grams of protein and only 180 calories. This is a great snack/breakfast solution for busy day. This week flavor: Peanut-Toffee or Apricot – Pistachio, or Banana-Berry! 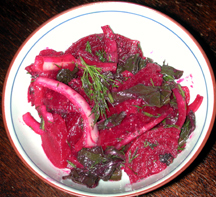 Roasted Beet Salad with Herbs. 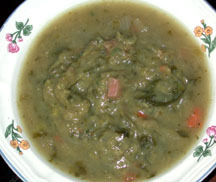 This a lovely side dish that can be served cold or warm. We supply a tart dressing super-flavored with dill and mix it with beautiful deep red beets, sweet onion and a sprinkle of Feta cheese. Great alone or on a bed of greens. About 130 calories per serving. Siam Coco-Ginger Soup! 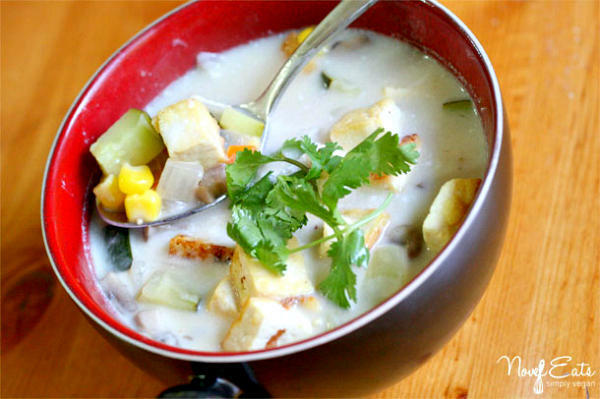 A wonderful light vegetable soup with tofu, a variety of veggies, including corn and an exotic broth flavored with lemon grass, jalapeno, lime leaves, and coconut milk. 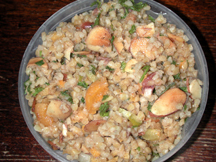 Bulgar Dill Salad! So fresh and filling. 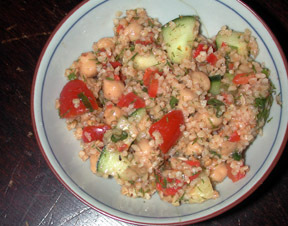 We start with coarse bulgar and chickpeas, then add cherry tomatoes, cucumber, sun-dried tomatoes, roasted red pepper, lots of dill, and a balsamic dressing. It’s calorie-dense but filled with fiber! (about 250 cals/serving). Chipolte Dip! Simply delicious! Lemon, garlic, chipolte, cumin, cilantro, and chickpeas. Perfect balance of spicy, heat, sweet and healthy! 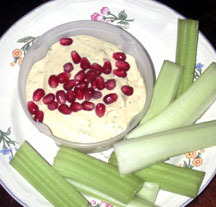 Served with a stack of celery, it makes for a flavorful and healthy snack filled with fiber, protein and joy. PROTEIN WRAPS! This week, try our tasty and healthy Chicken n Avocado Wrap! 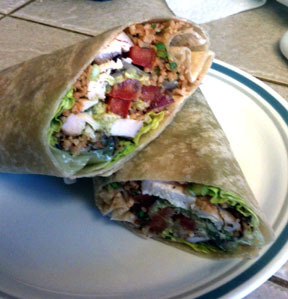 We include home-cooked chicken breast, avocado, red onion, cucumber, lemony couscous, spicey spread and romaine in one wrap! Less than 350 calories and 28 grams of protein. CAN REQUEST NO TORTILLA if ordered by Saturday (saves about 150 calories)! Egg Salad – Green Salad! Our BIG green salads are fresh, seasonal, and diversified with a variety of veggies, protein, fiber and flavor! 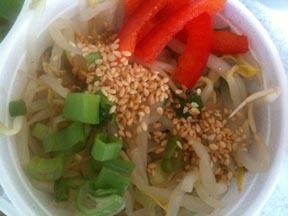 This week’s salad includes: a traditional favorite! A protein-rich big scoop of our flavorful egg salad , surrounded by lettuce with chopped tomato, cucumber, red onion, parsley, and celery.. (less than 250 calories/container). Natural Protein Bars! Handy, tasty, healthy, and chemical/ preservative-free (so much better than the commercial ones that stay on the grocery shelf for a year!). Each bar contains 16 grams of protein and only 180 calories. This is a great snack/breakfast solution for busy day. This week flavor: Peanut-Toffee or Apricot – Pistachio!